This is one of the good moral stories for students. Once upon a time, there was a King of the owls and the King of the crows. The King of the owl used his owl group and bully the crows often. These two groups never got along. One day, the King of owl declared that he will kill all the crows. When the crow King heard this, he consulted with his ministers on how to deal with this war with the owls. The blue crow was supposed to be the smartest among his crow group. 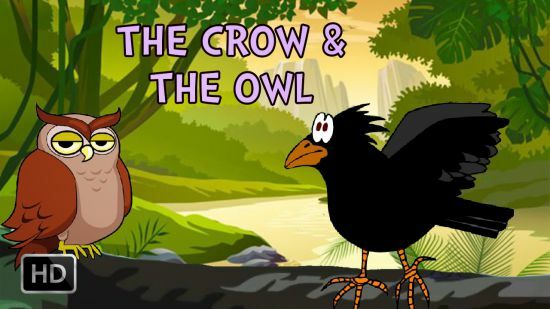 the blue crow then said, “If we lose to the owls, it will be a shame! We need to use our intelligence to defeat the owls.” The crow King agreed. Also, read A Wise Old Owl Story. The crow King asked, “What kind of a plan should we use to defeat them?” To this, the blue crow said, “When the war comes from the owls, you will have to cut my feathers and claws. You must leave me and run away from here temporarily! Later, I will defeat the owls when they are here.” The crow group were sad for this plan but agreed to follow and left the blue crow alone near a tree. And all the crows fled the place temporarily. As soon as the owl King heard it, he thought this was true and that he shoukd take the blue crow with them. Soon, the owl minister stepped in and said, “This is the brightest crow minister. He may be lying to us! It’s better we leave him behind!” The owl King didn’t agree. He took the crow with them and made him one of his ministers. He removed all of his old ministers from their positions. You may also like to read, The Greedy Crow Story. A few days later, owl King asked the crow if he can make a good nest for the owls. The crow suggested using dry leaves and grasses for warmth and comfort. All the owls believed him and made their nests with dry leaves and dry grasses. The blue crow wandered during the day and pretended to be a protector during the night. One day, he went back to his crow group and said, “You should all bring fire tomorrow during the day,” and he left. The next morning, when all the crows were sleeping, the crows came with fire and put fire in each of the owl’s nests and all the owls died in the fire. From then on, the crows lived happily and peacefully. Also read The Swan And The Owl. MORAL OF GOOD MORAL STORIES FOR STUDENTS: A DISLOYAL PERSON WHO COMES FROM THE ENEMY CAMP SHOULD NEVER BE BELIEVED.